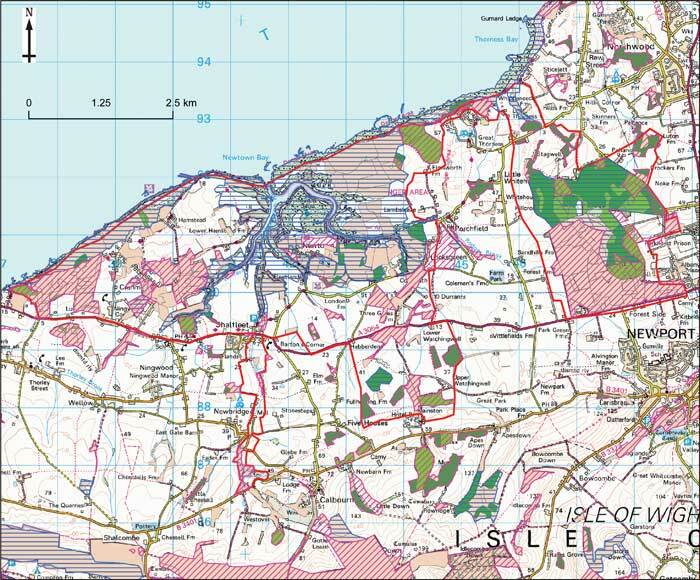 This map is based on Ordnance Survey material with the permission of Ordnance Survey on behalf of the Controller of Her Majesty's Stationery Office � Crown copyright. Unauthorised reproduction infringes Crown copyright and may lead to prosecution or civil proceedings. 100019229 2008. The wooded north-western area of the Island from east of Yarmouth, through to Thorness Bay and Parkhurst Forest, and including the more open area around Newtown National Nature Reserve. Isle of Wight Joint Character Area: Northern woodlands, traditional enclosed pasture, harbours and creeks. A well wooded landscape extending from Parkhurst Forest in the east, linked by hedgerows to the woodlands around the Newtown estuary the woodlands at Bouldnor. Also the lower parts of the river valleys of the Caulbourne, Newtown river, Clamerkin, Western Haven and Thorness. The land use is predominantly small fields down to pasture on heavy clays. Hamstead beds, Bembridge Marls, Bembridge Limestone, Headon and Osborne Beds and partly extending on to the Bracklesham beds. Alluvium in the river valleys with some river terrace deposits in Parkhurst and Bouldnor Forests. Tidal flat deposits in Newtown Harbour. Gently undulating landscape crossed by a series of small streams flowing south –north through shallow valleys. Low slumping clay cliffs in the vicinity of Bouldnor. Red Squirrel; Dormouse; Woodland bats; Curlew (wintering); Black-tailed godwit (wintering); Lapwing (wintering); Brent goose (wintering); White admiral; Small pearl-bordered fritillary; Pearl-bordered fritillary; Brown Hairstreak; Reddish buff moth; Small cord grass; Pale dog violet; Nightjar; Great crested newt; White letter hairstreak; Pillwort; Lobularia pulmonia; Brown hare; Lagoon sand shrimp; Yellowhammer; Reed bunting; Slender Hare’s ear; Divided sedge; Adder; Skylark. Public rights of way network crosses the area as a whole. 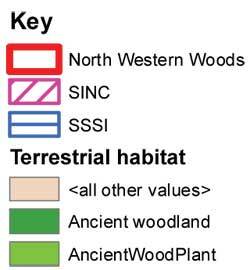 Open access in Parkhurst Forest and Bouldnor Forest; no access to MOD land.